The China (Guangzhou) International Game and Amusement Fair 2019 provides an entry path into the Chinese Amusement and Attractions market. As the biggest amusement exhibitors in South-China, AAA meets thousands of insiders and greatly promotes the development of the Chinese amusement industry. The Southern China market is expected to possess great potential, as 18 billion RMB will be invested in Entertainment and Attractions. A 18 billion yuan investment has been put into Novotown Hengqin, a large-scale cultural tourism project in Zhuhai, China, and it will be put into operation in the first half of 2019. The first edition will also include Lionsgate Entertainment World, the first movie indoor interactive experience centre in Asia. With more than 30 immersive amusement equipment, visitors can experience movies like The Hunger Games, The Twilight Saga, The Divergent Series and Now You See Me in a whole new way. Xie Anjian, the project director at Lai Sun Group (who invested in the Lionsgate Entertainment World) says that the Hengqin district, Zhuhai City is suitable for developing cerative culture, tourism and leisure due to its geographical advantage. It is planned to be established as an incubator for the creative culture industry in Guangdong, Hong Kong, Macau and Taiwan. 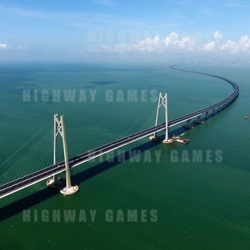 Techonology and the economy of Southern China have also been developing more rapidly since the opening of the Hong Kong-Zhuhai-Macau Bridge, which has been awarded "One of The Seven Wonders of the Modern World" by The Guardian.